==the Muslim world has adjusted to the new Mongol dynasties-- geographically and politically speaking, at least. 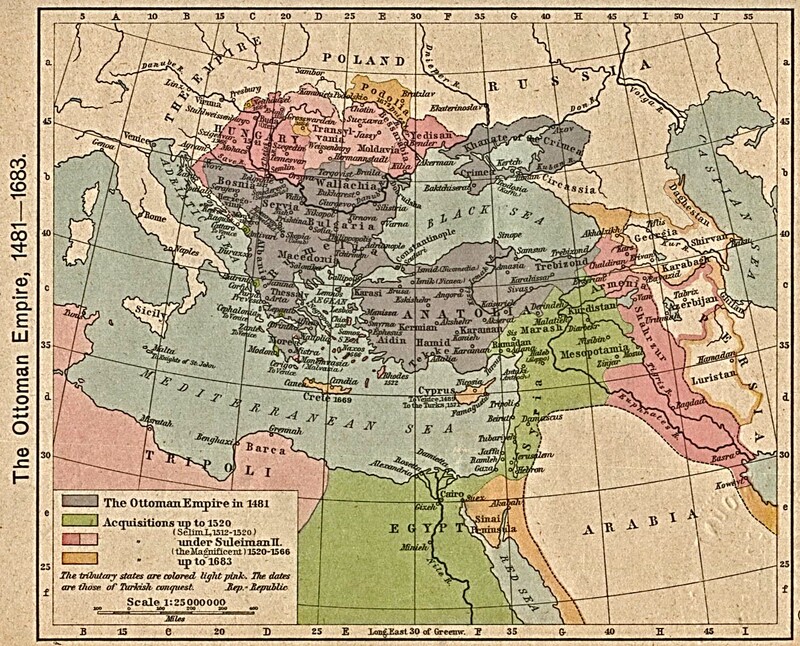 By the 1480's, the Ottoman Empire is starting to take shape (*Univ. of Texas*). And it has its own magnificent art (*Met*). ==Guru Nanak (1469-1539), the founder of Sikhism, is also a great devotee of a "nirgun" God, and seeks a religious path that avoids the formal structures of both Islam and Hinduism. Shortly before the end of the century he attains full realization of the path he is to take, and begins to teach and to acquire followers. His poems, often sung, are the heart of the later Guru Granth Sahib. More on him and on Sikhism: *Sources of Indian Tradition*. ==Chaitanya and Bengali Vaishnavism: The distinctively Bengali "Gaudiya sampraday" school of Krishna-bhakti takes shape under the influence of Shri Krishna Chaitanya (1486?-1534?) (*John Beames*), thought by his followers to be an incarnation of Krishna himself. Chaitanya incorporates the verses of Jayadeva (*Black Peacock*), and of his own slightly earlier Bengali contemporaries Chandidas (1417?-78?) (*sacred-texts*) and Bidyapati (1433?-81?) (*John Beames*), into a theology based on rapt contemplation of the love of Radha and Krishna (*British Museum*). ==the Hatha-yoga-pradipika (1400's) by Svatmarama: an influential handbook about a traditional meditative body-and-mind discipline, composed by an author about whom little is known. Available in a translation by *Brian Dana Akers*. A modern discussion of the discipline: *hatha yoga*. A good academic overview: *Theory And Practice of Yoga (2005)*.